EX condition and used very little with original box. Fantastic 12" subwoofer from Miller & Kreisel. Powered with 75 watts. This thing has incredible depth and low frequency response. I don't see any issues with the foam surround. Approx 45 lbs. It is in great looking and solid working condition. Has the classic M & K headroom maximizer that was used on their high end subs. Scuffs and marking is very minimal. This sub works great in smaller rooms. Miller & Kreisel, M&K 12" Subwoofer Woofers. Local pick and inspection is free and CASH only when you do pick up. PLESE SEE PHOTOS FOR ALL THE DETAILS. Subwoofer is in a great condition, working expected. Please see pictures for more details. Free shipping to lower 48 states only. What is Included: Subwoofer, Spikes. We specialize in well-cared for, previously used gear because that is what we are passionate about. We feel that there is nothing more fulfilling than creating a high-performance system on a budget with carefully selected used components, speakers and cables. M&K/Dayton Audio Custom Subwoofer. 8 inch Dayton Audio classic subwoofer driver. Miller and Kriesel amplifier. 50 Watts I believe. I recently finished this and really want to make another so this is for sale. I purchased the driver new. The amp I purchased used. I have been using this in my system for a short time. The driver might not even be completely broken in yet. The cabinet is made from a repurposed Douglas Fir 2x12 I had used as a plank a couple years ago. I planed it to about 1 1/8 inches thick. It is stained ebony color and has 4 coats of an alkyd modified urethane. It it very solid and heavy for its size. Bass is impressive for a small sub. 11x13x14 inched overall. Miller & Kreisel M&K VX-7 Powered Subwoofer in very good working condition. Miller & Kreisel, M&K VX-7 Powered Subwoofer Used, As-is. A few nicks.. Condition is Used. Shipped with USPS Parcel Select Ground. Miller & Kreisel : M&K MX-100 Powered Subwoofer . Sounds unbelievable. Original eminence woofers with new surround professionally installed. Missing front cover and some cosmetic flaws . This sub will shake your neighbors home down the street . This Subwoofer is real audio grade.in working good condition.If you like to play with European speakers, and this the best match to provide the low frequency with the mid size speakers. RCA Adapter is included, which provide a clean and deep bass. Great subwoofer. 8 inch with amp, so it is active. Speakers pass thru possible Black gloss finish. There are small scratches or rather smudges on top part,like with all gloss finishes. Nothing major. Performance is great Fully working condition. Feel free to ask questions. Thanks. Shipping will be around 50$, insured and with tracking info. UP FOR SALE: A MILLER AND KREISEL VX-7 MARK II POWERED SUBWOOFER. THIS SUB IS IN FULL WORKING ORDER AND SOUNDS AMAZING. UP FOR SALE IS M&K - MILLER & KREISEL V-3B POWERED SUBWOOFER. THIS SUB IS IN EXCELLENT WORKING CONDITION, WORKS FLAWLESSLY. GRILL CLOTH IS A BIT WAVY AND IT HAD FIVE HOLES THAT HAVE BEEN TOUCHED UP TO MAKE THEM LESS NOTICEABLE. Driver: 12" long-throw treated-paper subwoofer driver. Internal Amplifier: 150 watt continuous all-discrete power amplifier with M&K Dynamic Headroom MaximizerTM circuit. Line-level and speaker level inputs and outputs. Subwoofer in great shape! Will need the 12” woofer replaced. You can find them for cheap online. Very rare price for this subwoofer. MK Sound KX10 Subwoofer. ENCLOSURE TYPE: WOOFER. Up for Sale is M&K Miller & Kreisel MX-350THX Powered Subwoofer Speaker. Near Mint Condition. Just Light Scratches on Top. MX-70B Subwoofer. 125 WATT RMS INTERNAL POWER AMPLIFIER WITH NEW ACTIVE HEADROOM MAXIMIZER II. Miller & Kreisel Sound. M&K MX 105 MARK II. Form Factor. Amplification Type. 20 - 125 Hz. POWER DEVICE. AUDIO SYSTEM. COMPATIBILITY | ACCESSORIES. WOOFER: Single 8" Driver. K-9 ENCLOSURE TYPE: Sealed Box. WEIGHT: 21 lbs. The unit is New in Original Box. The units has been part of my collection. And Many Yet to Be Listed. Made in USA. FREQUENCY RESPONSE: 35Hz - 200Hz ± 3dB. 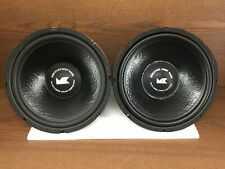 For 2 x 12" Woofers. Showing the whole unit is for information purpose only. This was recently sent out to the Bob Carver Corp for inspection and repairs. This unit was handled per Fran Malitz who is CEO of Bob Carver Group. Per Frank on the internals, this unit was, "Rebuilt, upgraded and thoroughly tested". M&K- MILLER AND KREISEL VX-7 POWERED SUBWOOFER. Condition is Used. Shipped with USPS Parcel Select Ground. Up for sale is a Used Custom Subwoofer. The enclosure is custom, however the amplifier is M&K (Miller & Kreisel). Along with the subwoofer, I am including 5 FREE SPEAKERS (4 Floor Standing, 1 Smaller Soundbar Type). Condition Check all Photos ! I hope this is exactly what you are looking for. No brainer here. Used home subwoofer. Runs at 500W RMS. Tested with voltmeter at original 4 ohm impedance. US Continental only. Pioneer SW-8MK2 Andrew Jones Designed 100-Watt Powered Subwoofer. Condition is Used. Shipped with USPS Parcel Select Ground. Powered Subwoofer. Andrew Jones Designed. The picture of each speaker is the one you will get and reflects how the front will look when mounted in your cabinet. Subwoofer has been tested and does work as it should. › Weight (each)...20 lbs 4 oz. Box art, manufacturer design and such may vary. to12142018jm1007490 19-3.